What is the Slumber Bash? The 4th Annual Design Appétit will be an exciting multi-day event serving the mission of Focus on Home – providing furniture to families transitioning out of homelessness. Guests and sponsors will enjoy a beautiful 4-course dinner prepared by local chefs thoughtfully set at themed tablescapes designed by local artists and designers. Following dinner, sponsors will be invited to prepare the beds of their sponsored child and write an encouraging note to their appointed child. Sponsors will be invited to a special mocktail cookies and milk party to kick off the Slumber Bash and meet the child they have sponsored. 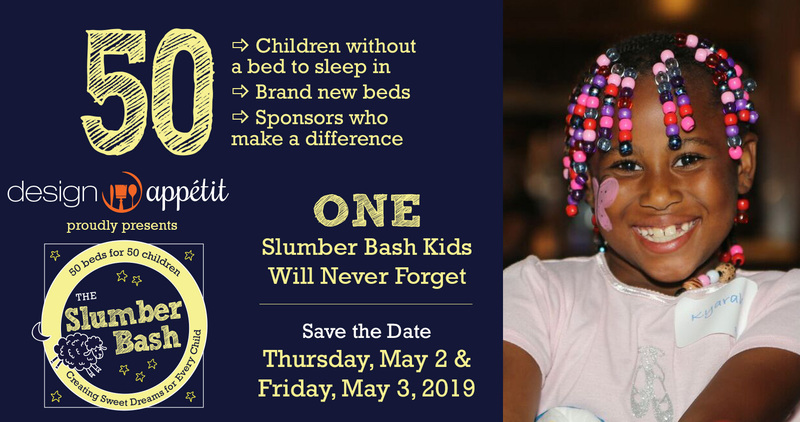 Beds will be delivered to the children’s homes early in the morning so each child may enjoy a comfortable night’s slumber for many years to come!